The upcoming presidential election will be one of the most followed in history. Be sure to show off your political pride with democratic buttons. These buttons show who you will be supporting this November and will encourage everyone you pass by to do the same. 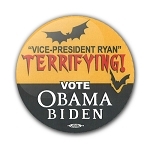 You can purchase a democrat button in a vast array of styles. From round button that show off your support for gay rights to a square Obama button that encourages others to vote for him this November, there are many different kinds available. In addition, you can purchase and wear an Obama button that has his picture on it, calls for his re-election or humorously displays a picture of him playing basketball. If you simply wish to encourage others to vote democrat, you can purchase a vote democrat button that displays the infamous blue and red donkey. Vote Obama buttons are even available in different languages including Spanish and Hebrew. Be sure to support your favorite presidential candidate throughout the upcoming months with democratic buttons. Wear them on your college campus, to the movies or even to sporting event to get the word out and spark conversation about why you will be voting democrat this year and to encourage others to do so.